The El Dorado Hills Chamber of Commerce is hard at work advocating on behalf of businesses to local, regional and national decision makers on policies that directly impact businesses. We have a dedicated team who serve on our Government Relations Committee who are appointed by the Board to review proposed legislation or issues, which might have ramifications for local businesses. This committee makes recommendations to the Board of Directors for the purposes of establishing official Chamber positions. We are also a part of El Dorado County Joint Chambers Commission. Joint Chambers of Commerce includes representatives from the El Dorado County Chamber of Commerce, the Shingle Springs/Cameron Park Chamber of Commerce and the El Dorado Hills Chamber of Commerce. In order for an action to move forward, all three Chambers must be in agreement. Additionally, Debbie Manning, President & CEO, participates in weekly conference calls with the California Chamber of Commerce to focus on statewide policy. She frequently attends County Board of Supervisors meetings and meets regularly with the Supervisors on issues related to helping, keeping and attracting businesses to El Dorado Hills. The El Dorado Hills Chamber of Commerce, through the California Chamber of Commerce, signed on to the coalition to oppose SB 135 (Jackson), which has been identified as a job killer, which would significantly harm small employers in California with as few as 5 employees by requiring these employers to provide 12 weeks of a protected leave of absence each year, in addition to existing leaves of absences already required, as well as potentially require larger employers to provide 10 month of protected leave, with the exposure to costly litigation for any alleged violation. Click here to view letter. In December 2017, five local chamber of commerce organizations in the greater Sacramento region agreed to collaborate to amplify their members' voices before the California State Legislature. By forming UCAN - the United Chamber Advocacy Network - the Elk Grove, Folsom, Rancho Cordova, Roseville area Chambers of Commerce, El Dorado County Chamber and El Dorado Hills Chamber worked to identify their members' top state-level concerns, taken positions on state legislation and advanced those positions before our state legislative delegation, policy committees, and the administration. In 2019, the landscape at the State Capitol in Sacramento has shifted once again and the need to represent the interest of small business owners and operators is more important than ever. CLICK HERE for United Chamber Advocacy Network information! On behalf of the El Dorado Hills Chamber of Commerce we are concerned that the County has lost sight of their adopted 2016 Strategic Plan; https://www.edcgov.us/Government/CAO/StrategicPlan/Pages/Economic-Development.aspx. The first goal, Economic Develpment; enable a prosperous and vibrant economy. Click here to view the letter. Attached is our letter of support from May 21, 2014 for the El Dorado Hills Apartment project in Town Center proposed by the Spanos Corporation. Our position today remains the same for this important project for our community that will support both existing retail in addition to providing the foundation for future commercial development. Click here to view the letter. The El Dorado Hills Chamber of Commerce, as a member of the Joint Chambers Commission, strongly opposes AB 5, which has been labeled a job killer, because it will limit employers’ ability to effectively manage their workforce to address both consumer and employee requests, subject employers to costly fines and multiple avenues of litigation for technical violations that do not actually result in any harm to the employee, is inconsistent with existing law, and will limit job opportunities for unemployed workers. Click here to view the letter. 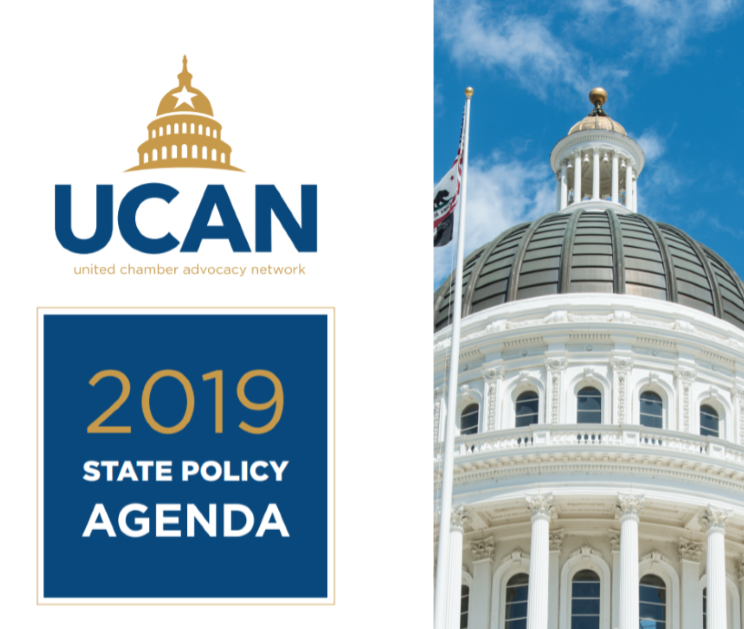 That’s why the El Dorado Hills Chamber of Commerce has teamed with several other local chambers of commerce in the greater Sacramento area to form UCAN – the United Chamber Advocacy Network – where you can make a difference for business in California! Click on the links below to find out more information click here 2018 Annual Report. The El Dorado Hills Chamber of Commerce President and CEO, Debbie Manning, wrote a letter to The Honorable Elaine L. Chao, Secretary of Transportation, to express the Chamber's support for the Capital SouthEast Connector Joint Powers Authority's application for an Infrastructure for Rebuilding America (INFRA) grant. Click here to view letter. The El Dorado Hills Chamber of Commerce, as a member of the Joint Chambers Commission, strongly opposes Assembly Bill 1 because it will raise gas taxes and fees, fundamentally hurting the middle class and low income communities. Click here to view letter. The El Dorado Hills Chamber of Commerce, as a member of the Joint Chambers Commission, strongly opposes Senate Bill 1 because it will raise gas taxes and fees, fundamentally hurting the middle class and low income communities. Click here to view letter. The El Dorado Hills Chamber of Commerce, as a member of the Joint Chambers Commission, is signing onto the Coalition for Affordable, Reliable and Equitable (CARE) Housing for the opposition of Assembly Bill 199 - Prevailing Wage on Private Residential Construction. If AB 199's mandated prevailing wage passes, it could overturn current law and require higher labor and housing costs on new apartments and housing in California. As the cost of construction skyrockets, projects may become unfeasible and new for sale and rental housing projects will be abandoned. Plus, this detrimental bill could result in tens of thousands of jobs killed. To read the letter of opposition, please click here. The El Dorado Hills Chamber of Commerce, through the California Chamber of Commerce, signed on to the coalition to oppose SB 63 (Jackson), which has been identified as a job killer. The bill targets and will significantly harm small employers in California with as few as 20 employees by adding to the existing burden under which they already struggle. Click here to view letter. The El Dorado Hills Chamber of Commerce, through the California Chamber of Commerce, signed on to the coalition to oppose AB 5 (Gonzalez Fletcher/Kalra), which has been labeled a job killer, because it will limit employers’ ability to effectively manage their workforce to address both consumer and employee requests, subject employers to costly fines and multiple avenues of litigation for technical violations that do not actually result in any harm to the employee, is inconsistent with existing law, and will limit job opportunities for unemployed workers. Click here to view letter. The El Dorado Hills Chamber of Commerce opposes this bill through a coalition of Chambers established by the California Chamber of Commerce, as it unfairly targets two classifications of employers, increases their costs, and creates a competitive disadvantage by forcing them to recognize Thanksgiving as a “family holiday” and compensate all employees with double the regular rate of pay for work performed on that day. The El Dorado Hills Chamber believes Measure E & Measure G are bad for business and will effectively stop all non-residential uses (agricultural, public facilities, Business Park research and development, commercial, CSD and government actions) that require discretionary approvals. The El Dorado Hills Chamber of Commerce opposes this bill through a coalition of Chambers established by the California Chamber of Commerce, which was identified as a job killer which would eliminate flexibility in the workplace for both employers and employees. The El Dorado Hills Chamber of Commerce opposes this bill through a coalition of Chambers established by the California Chamber of Commerce, which was labeled as a job killer and will potentially impose a 50% increase in the minimum wage over the next six years for employers with more than 256 employees. The Chamber is very concerned for the future of our businesses, both commercial and retail if these Measures pass. We believe these Measures are “job killers” for El Dorado Hills and El Dorado County. This project will support both existing retail in addition to providing the foundation for future commercial development. The El Dorado Hills Chamber of Commerce, through our Government Relations Committee, is keeping a close eye on these “job killer” bills. The Chamber is on record as opposing SB935 which would raise the minimum wage to $13.00 per hour by 2017 and AB1522 which would mandate paid sick leave (3 days minimum) for all California employers except those with collective bargaining agreements. The El Dorado Hills Chamber of Commerce OPPOSES SB 626 (Beall) because it would severely undercut the workers compensation reform deal agreed to by labor unions and employers in 2012 and would result in dramatic cost increases to California employers. This legislation will require online retailers to collect sales taxes on retail purchases in the same manner in which local merchants now do. support for both with recommendations. Chamber signs on to OPPOSE SB626. SB626 would severely undercut the recent balanced workers' compensation reform deal agreed to by labor unions and employers and would result in dramatic cost increases to California employers. Chamber encourages Board of Supervisors vote in support of the Plan of Finance for the Capital SouthEast Connector. In anticipation of the upcoming vote of the Capital SouthEast Connector Joint Powers Authority on the project's 2012 Initial Plan of Finance, on behalf of the El Dorado Hills Chamber of Commerce I wanted to convey our support for moving this project forward due primarily to its economic development benefits.